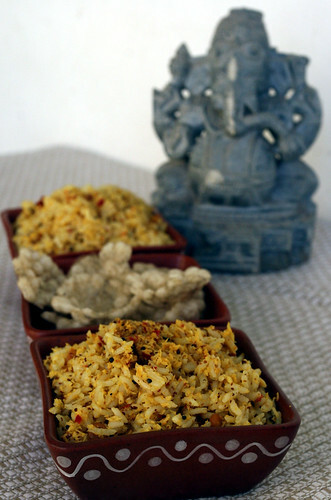 Mustard SEED Rice known as Kadugu Chithra Annam in Telugu, is a traditional rice dish with a rich texture. Combines the sweetness of coconut, bitterness of mustard and tanginess of lemon. This recipe has been shared by Shanta Kumari, a great-granny from Chennai. Jains can prepare this recipe during Paryushan by substituting fresh coconut with khopra and lemon juice with amchur powder. 1. Boil the rice and allow it to cool. Each grain of the cooked rice must be separate. 2. Grind the ingredients for the masala along with salt and turmeric using very little water. 3. Heat the oil in a wok. Add the bengal gram and black gram, and as they turn golden, add the mustard. Serve hot with fried papads. This recipe was first published in The Great Granny Diaries – a column in Harmony Magazine. Part-1 of this post is the interview with Shanta Kumari, a Telugu great-granny from Chennai. What a treasure trove your blog is!